Blue on Water has an open kitchen. Walk in at the beginning of meal service and you’re likely to smell the enticing aroma of caramelizing meat, simmering sausage soup, or a rackful of warm tartelettes Tatin. You may also detect something else, the “sweet smell of success.” One glance around and you can see it. Before your first Pinot Grigio is poured you can sense it. 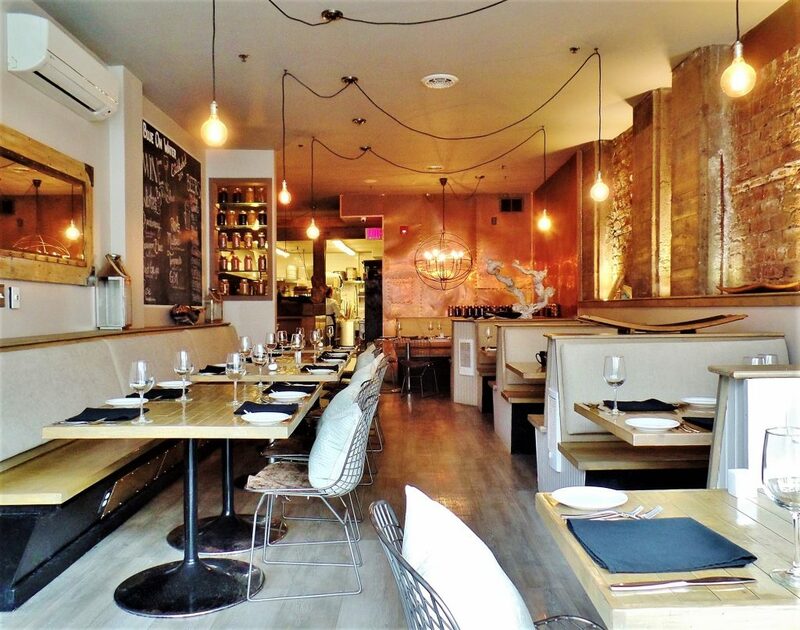 Blue is a restaurant where everything seems to effortlessly fall into place. But nothing about it is effortless. Success can only be achieved with determined, focused effort. The restaurant is always improving. It’s clear the owners, managers, chefs and servers have a common goal – to keep Blue on Water fresh and relevant. By month’s end, for example, Blue’s talented chef, Adam Gravatt, will have a new dinner menu in place. Gravatt, who’s been with Blue for about four years, is largely responsible for the noticeable improvement in the restaurant’s food, meliorism which coincided with his arrival. I took my friend Linda to Blue for lunch. It was busy. We sat in the window. 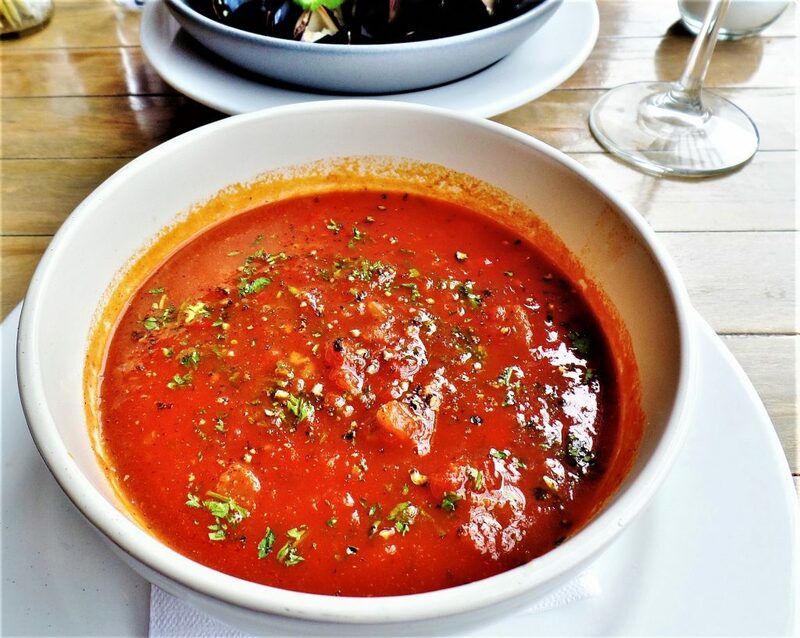 In winter, window dining is the next best thing to patio or sidewalk dining. Since I first wrote about Blue, 13 years ago, it’s grown, literally and figuratively. The kitchen’s been revealed and easy access to the bar was established. Blue on Water’s bar recently underwent a redo, that makes the area seem roomier. Service is better, more professional, and, as mentioned, Blue’s cuisine is far better than it was a decade ago. The dining room always aspired to be sophisticated and signaled its self-accorded status as what we used to call, “a fine dining establishment.” Now it’s embraced au courant restaurant style: modern, less frilly, no longer unsure about what it is or where it’s going. It’s a confident room with confident kitchen and confident staff. Blue’s walls are a combination of smooth and rough – rough, well-worn brick. Artificial light comes from naked bulbs, at the end of long wires, that dangle like baubles. On one side of the narrow room there’s a row of four neatly constructed, comfortable booths. Opposite is a row of tables and chairs against a long banquette. The tables – set with wine glasses, napkins and plates – are ready to receive guests. Above the banquette a large chalk blackboard advertises wines and beers. Next to the blackboard a narrow room divider with shelves displays bottled summer and fall produce. 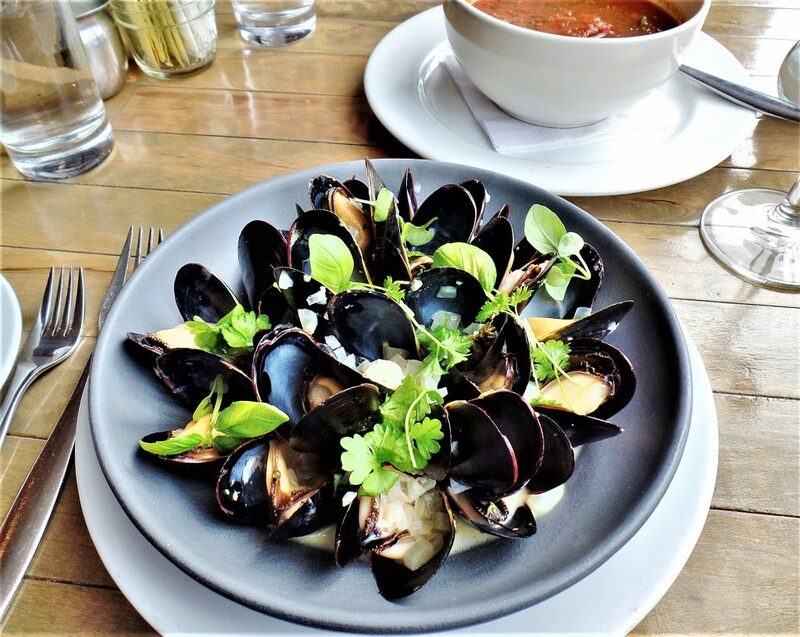 Mussels, freshly steamed and on the shell, came in a bluish, grey bowl. They’d been arranged to look like a large, exotic bloom. A labour-intensive project, but, it made an impression. The pale, soft creatures, cooked in white wine and thyme, were enriched with cream and a stir of mustard. Sprigs of herbs and finely diced onion, strewn over all, improved the taste and presentation – although in some respects it was like gilding a lily. Linda’s starter was sausage and red bell pepper soup. It was served straight-up, with only a pinch of finely chopped parsley and cracked black pepper for garnish. No sprigs or shaved parmesan on top. It wasn’t as thick, but it reminded me of the very best, freshly made spaghetti sauce. Sweet pepper, sausage, tomato and Italian herbs and spices are a wonderful combination, especially with flavours that only come from slow and low cooking. It was a real treat. There’s a provençal dish called barigoule. Barigoule is the name given a milk-cap mushroom in France. Barigoule also refers to a method of preparing artichokes and mushrooms together. Artichokes, white mushrooms, cauliflower and carrots are sautéed and simmered in white wine, water and a squeeze of lemon. Blue on Water’s version includes fish. Chef Gravatt’s salmon à la barigoule is barigoule with the addition of a fresh salmon cutlet, a welcome interloper. It’s now my favourite way to enjoy salmon. I liked the piquancy given the dish by the citrusy wine broth, almost like hot and sour soup. 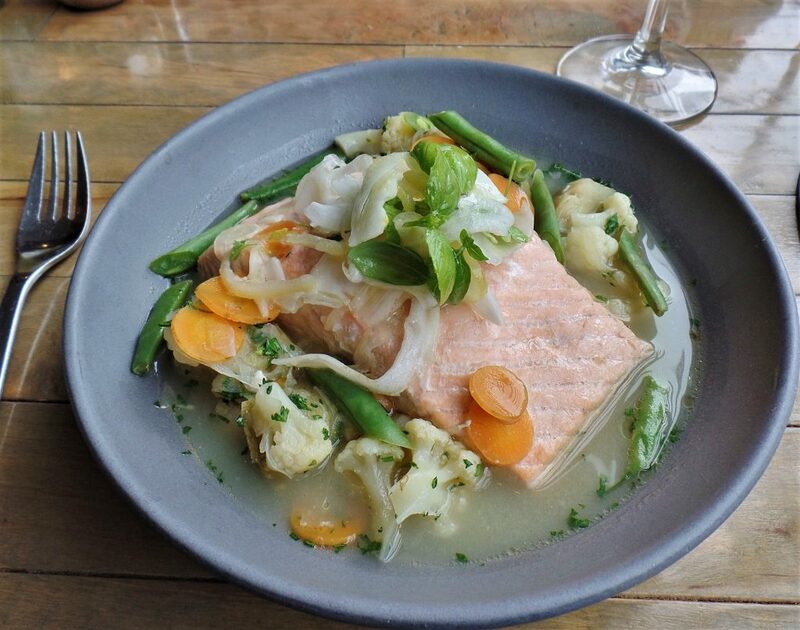 Salmon served in this way is lighter and milder. Beets come in all colours, if not shapes. I’ve seen white, gold, yellow, pink, red, blood red and purple red. 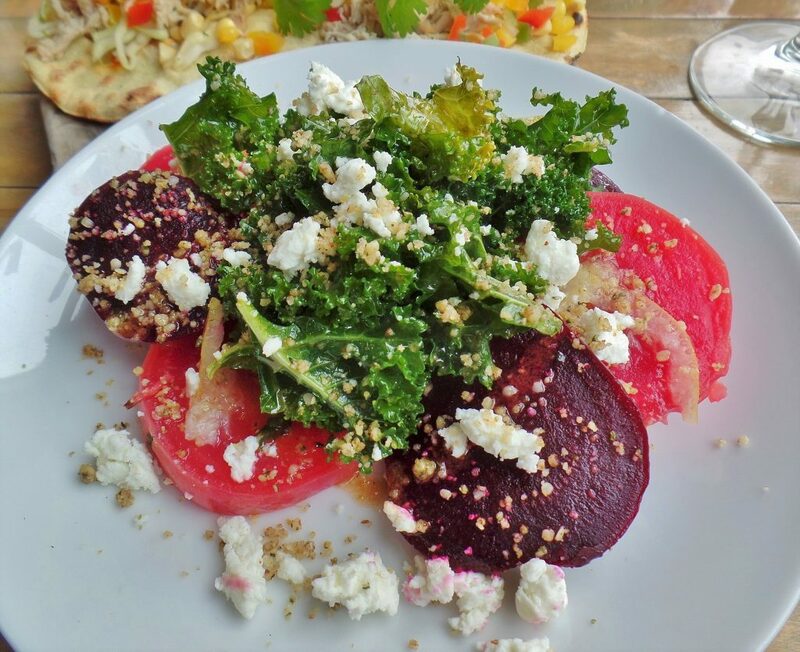 Blue’s beet salad had slices of pink and purple red beets, kale, goat cheese and hemp seed crumble. It was dressed with pomegranate vinaigrette. Fresh, butter smooth goat cheese made a big impression, and, along with the brightly flavoured beets, made the salad very delicious. It’s taken a few years, but tacos now seem to be a standard item on most restaurant menus, especially fried cod tacos. Blue serves salmon or chicken tacos. Linda had the chicken with red cabbage, corn salsa, jalapeño jam and lime buttermilk. 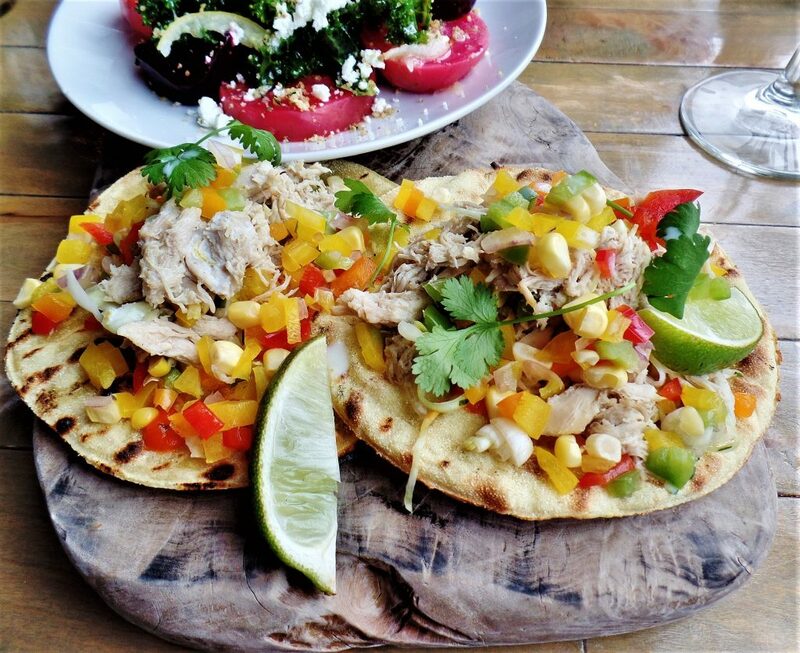 Two tacos were served open-faced, displaying what was essentially a colourful Mexican chicken salad. With a spritz from the fresh quarters of lime provided, the tacos tasted like summer. Our dessert wasn’t Tarte Tatin – the famous apple tart invented at Hôtel Tatin, Lamotte-Beuvron, France – but more of a tartelette Tatin or tartelette pomme. 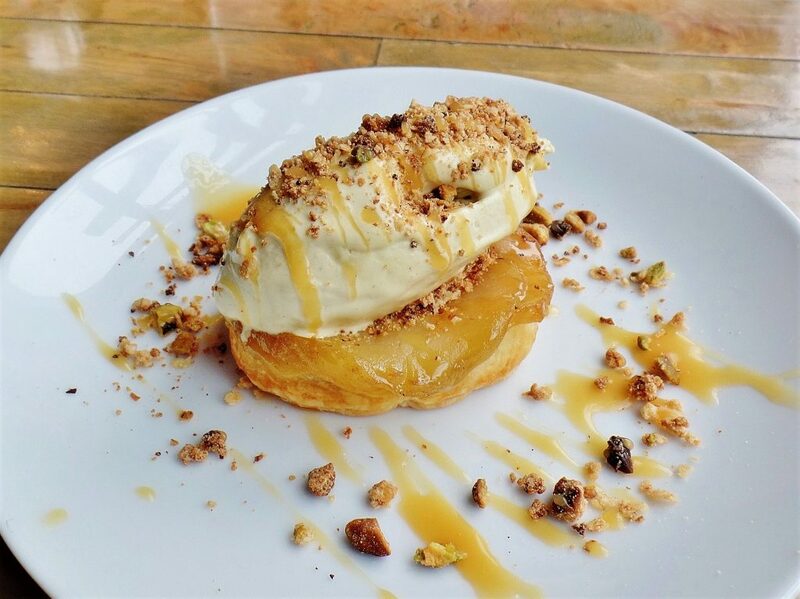 It came topped with a quenelle of homemade nut flavoured ice cream. The tender pastry combined with jammy, caramelized apple was excellent, and the ice cream was exceptionally good. My father was a chef, then a butcher and finally a grocer. If he’d become a restaurateur it would have seemed quite logical to me, because, thinking like the child I was, I would have thought him qualified based on his cooking experience, not because he’d run three businesses. Price Lunch for two with wine, tax and tip costs approximately $140. Open Monday to Friday: 7:30 a.m. to 10 p.m. Saturday: 9 a.m. to 10 p.m. Sunday: 9 a.m. to 9 p.m. Beverages Blue on Water has a comprehensive beverage selection. The house wine list features many New World wines with a handful of Italian choices. White and red lists include New World, French, Spanish and Italian wines. Blue also has a decent selection of sparkling wines and sauternes. Beer drinkers will find a broad selection of domestic and imported brews and several ciders. Classic cocktails are a specialty. Best bets Beet salad, sausage and red pepper soup, salmon à la barigoule and tartelette Tatin. Gluten free options Much of the menu can be adjusted to gluten free. Please ask server for details. Vegetarian and vegan options Some vegetarian options, others can be adjusted to vegetarian. Chef Gravatt can create a vegan dish if requested 24 hours in advance. Wheelchair access A difficult entrance, some accessible tables.